Hearts have beaten Edinburgh rivals Hibernian to sign Oxford United winger Chris Hackett for £20,000. He teams up with former United manager Graham Rix, now in charge of Hearts. The 22-year-old right-winger had six months left on his deal at the Kassam Stadium and could have moved from the League Two club for free in the summer. Meanwhile, Oxford have had a bid of £120,000 for an unnamed striker accepted by the player's club and he is now considering the move. Hibs had indicated their interest in Hackett, but he will arrive in Edinburgh on Wednesday to undergo a medical with city rivals Hearts. Oxford boss Brian Talbot had earlier said that he hoped to hold on to the winger but that the player had turned down talks about a new contract. 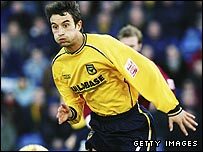 Hackett has been with Oxford since 1999 and has scored twice this season.